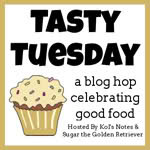 This entry was posted in Family, Holidays, Kitchen K9s, Our Pack, Relationships, Rescue and tagged cat rescue, cookbook, food, forever homes, Good Mews, Over the Rainbow Bridge, Puffy, Savannah's Paw Tracks, Zoolatry by heyitsjethere. Bookmark the permalink. Totally understand, thank you for your sympathy. Hey Mollie, Hey Alfie, Jetty here. Thanks guys. (Mom’s NJ term of endearment.) Aww, thanks on Miss Ann’s behalf… we though so too. We hope Good Mews sells lots! We sure are so sorry to hear about Puffy. It is so darn sad to lost a fur friend. Big hugs coming your way. That cook book is such a good idea. Hope a lot of copies sell to help those animals in the shelter. Hey it’s Jet here. Hi Miss Marg. Thanks for taking the time to send big hugs, they sure feel warm and cozy. Thanks for your compassionate call to Mom last night. Sorry I was busy wrestling Little Miss Chewminator! We think the same in our hearts… they were litter mates and had that special connection. Hey Giz, Jet here. Hi Miss JG. Thanks for your healingsnoogles and hugs, they help a lot. Mom and I are so sorry to hear about Puffy. It must be an odd feeling to go from 2 cats to being catless. Mom can’t imagine it having had at least one cat in her home since she was 7, I am not sure how I feel being a dog. At least the two are together again, maybe Puffy was just heart broken? Big paw hugs to you and your mom. 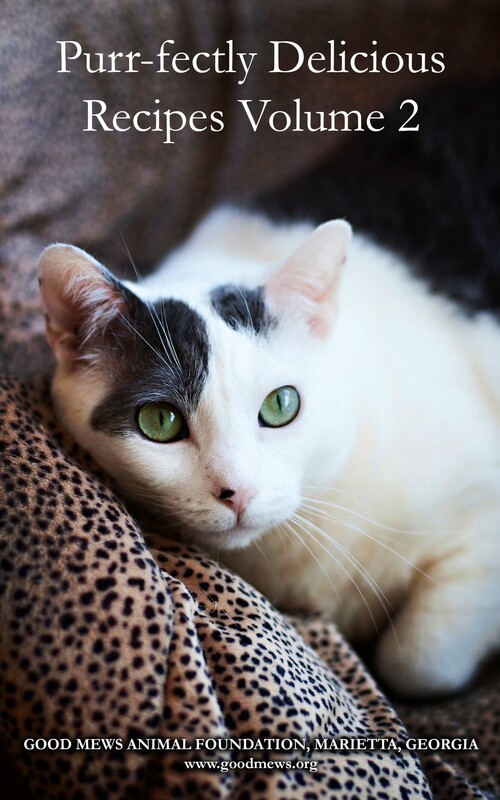 Maybe you guys can adopt a cat or two that need a home – that is what mom usually does. Just can’t be without cats. Mom would contemplate (VBP) that idea except we have a bunch of things in this place called (flux – VBP) so, we need to put this in the later pile. We’re so sorry to read about Puffy’s unexpected flight to the Rainbow Bridge. We know he’ll be greeted lovingly upon his arrival. Sorry we have to meet under these circumstances. Thank you for taking the time to write such comforting words to us. We know our brother, Fluffy will be waiting for him to help him cross. This gives us great comfort. Hey Ginger Jasper, Jet here. oh gosh i’m sorry, that is very sad news. that cookbook sounds huge, with 300 recipes? the typical pet cookbook doesn’t even have half that amount, sounds very interesting! Hey Yuki, Hey Rocket, Jet here. I was so sorry and shocked to hear of Puffy’s passing. I feel like I knew him thanks to you, I loved seeing that picture of him drinking from the sink. Fluffy will be happy to see him again and take good care of him. Your job Jet is to take good care of your Mom buddy, give her lots of extra loves from us. Hey Snoopy, Jet here. Hi Miss Annette. So sorry we are just responding to your kind words on Puffy’s passing now. We have been woefully behind in comments. Yes, we really believe that they needed to be reunited, even if it meant over the Rainbow Bridge. Hugs and licks to cheer you up. And what a lovely badge! Thanks for sending the licks and hugs, we feel comforted already. Sending Jetty kisses, JJ hugs and lovies from Mom. Hey Jack, Hey Ginger, Jets here. Hi Miss Rebecca. Mom’s got some water in her eyes after reading your beautiful poem, which resonates perfectly. Thanks for sharing such meaningful thoughts and comforting words. Words just never seem to be enough when you lose someone you love. So sorry for your loss. That sounds wonderful, Jet! Looking forward to it. Sorry we’re responding so late, we’ve been digging out of our comment backlog! Ditto, Jet. Way behind on my reading and posting. Thanks for catching up with us! I’m so sorry to be hearing about Puffy. He’ll always be in your heart and your memories will always be with you. Hey Amber and the Pack, Jet here. Amber, I know you and your family know only too well what we’re feeling today. Thank you for your soothing words. We just heard about Puffy. It’s always hard to lose a friend. May the memories of love outweigh the grief of loss. Hey TMNKH, Jet here. Hi Feeders! Not at all! We first started using it years ago and like it so much we have it as a card on our cafepress store. It stems from what what mom’s grandparents taught her as a little girl. Death is part of life, but we’ll all be together later in heaven. Until then, the memories of the love we share helps those of us left behind to wait. And mom found that to be true. You’re still sad, but if you focus on the love, it makes things easier, day by day. oh NOES, Jetty! We so very very sorry about Puffy. We’re sendnig out purrs to you & your mom today…. Thanks so much for your kind words of love and support. Please forgive our deep delay in responding to your comment. 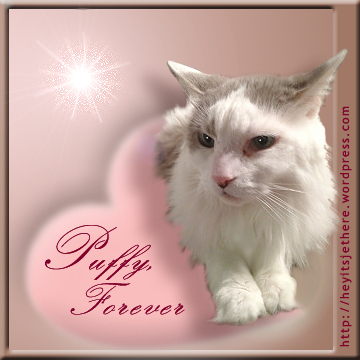 We heard from the Zoolatry girls that Puffy has passed on to Rainbow Bridge. We are so sorry to hear this and hope your memories of him will bring you comfort. Hey Team Tabby, Jet here. Please forgive our extreme delay in thanking you for sending such kind words of comfort on the passing of our feline brother,Puffy. We’re adjusting to a house without felines. Oh no! Awwww I am so sorry. Goodbye, beautiful Puffy. Please forgive our long delay in thanking you for your kind words and purrs of support. We are furrends of Savannah’s and we were so sad to hear about Puffy! We are sending you comforting purrs. Hey Nellie, Hey Kozmo, Hey Bob, Hey Cinnamon, Jet here. Hi Mommy. Hey Cody, Hey Dakota, Jet here. Hi Miss Caren. Thank you for your kinds words and prayers. Sorry we are so woefully behind with our comments, we’re finally digging out. Hi Jet – we were so sad to read about Puffy. The acd6pack knows about how much love cats bring to a home. We don’t mention them much, but we have two. Our thoughts are with you at this sad time. Please forgive our bad manners, we’ve been digging out of our comment backup! So, so sorry about Puffy! Sending hugs! Woofs from Jeffie and Rudy and meows from Skeeter. Hey Rudy, Hey Jeffie, Hey Skeeter, Jet here. Hi Miss Sue. Sorry for the incredibly delayed response, we’re still digging out. We are so sorry to hear about Puffy’s passing. That is a beautiful badge Ann made. Hey Fred, Hey Gloria, Jet here. Hi Miss Janet. Thank you for sending your support. I know, she’s so talented. Miss Linda, from Savannah’s Paw tracks is so thoughtful to have alerted Miss Ann. We are so sorry to hear about dear Puffy. We all send you lots of hugs. Thanks so much, we accept the hugs with deep gratitude. Really? Did you meet Savannah in blogville, too? Listen, Fenris, I’ll give you a tip, Mom’s the Kitchen Counselor and consults via technology (shocking but true!) and has a free newsletter and FB if Mom has any questions. We think we might buy the book for Mom for Hannukah!!! Sending thank you Jetty kisses and JJ hugs. We’re so sorry for the loss of your dear Puffy. Hey Oskar, Jet here. Hi Miss Pam. I’m so sorry to hear about Puffy. I’ll be thinking of you. Thanks, we deeply appreciate your comforting thoughts. Yeah, it was a bummer. Thanks for sending your thoughtful comment. Hey Chancy, Jet here. Hi Miss Mag. Thanks for sending thoughts, prayers and nose kisses, they mean the world to us. We are visiting from Alasandra’s blog. We are so sorry to hear about Puffy. Run happy and free at The Bridge, Puffy. Hey Sissy, it’s Jet here. Hi Miss Jenna. Thank you for sharing such beautiful sentiments regarding our boy. Mom always tells us (and others) to keep your memories in a pocket on your heart. So, that’s what we’re doing. Thanks for sending golden hugs, we love those at Casa Jetty! Yippee, let us know what you think of the book. 🙂 Cooking and food always make us feel better. So sorry for your lost. Bless Puffy. You are so kind to take the time to send comfort and support, thanks Maggie. Hey it’s Jet here. Hi Miss Bernadette. Sorry for your lost, Jet. Hey HIro, Hey Suki, Jet here. Hi Miss Dianda. Sorry we’re so late in thanking your for your words of condolence. We appreciate you taking the time. It’s okay, Jet. 🙂 I hope you are all feeling better! Tho, the feeling of losing someone never leaves, doesn’t it? We’re so very sorry that Puffy has crossed the Bridge to be with Fluffy. We’d like to include Puffy in the November issue of Our Rainbow Friends, if you don’t mind. Would you be so kind as to email us with Puffy’s age or date of birth to include in his memorial? And if you have a favorite photo of him you’d like us to use, please attach it. Or we can use Ann’s memorial badge, if you prefer. Thanks for allowing us to honor Puffy. We are so sorry to hear about sweet Puffy 😥 Sending our hugs and purrs of comfort your way. Hey Sherlock, Hey Ash, Hey Traveler, Jet here. The Producer’s been away for a couple of days so I’ve only just seen this. So sad, thinking of you all. I’ve had a hard time keeping up with blog news b/c I’m out of town but I just saw this today and I’m really sorry for your loss. It’s never easy to lose a friend. No worries, we know you’re there for us. (Is this your Best Friends time?) No, it’s not easy, however, with the loving arms surrounding us from Blogville, it sure is a lot easier. Yes, I am at Best Friends right now. I was able to catch up on reading blogs over the weekend. Again, I’m very sorry. Angel’s Rest, and I’ll be there later this morning. I’ll say a little something for Puffy. He Boomer, Hey Dottie, Jet here. Hi Miss Emily. Oh thank you for helping Mom with the name and thank you for doing that for us. Sending Jetty kisses and JJ hugs of appreciation. It’s the least I can do for you. It was a really nice day here in Kanab and it was very peaceful at Angel’s Rest. Hey it’s Jet here. Hi Miss Emily. What a beautiful experience, we’re soooo happy for you.